The first International Housewares Show of the millennium did have some of the products one would expect for the 21st century. 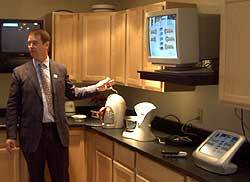 Although I didn't see the "Internet toaster" that industry pundits have been talking about for years, I did see several appliances that were Internet enabled and part of a home LAN (local area network). The show filled most of McCormick Place in Chicago (There were four floors at this show - it is HUGE.). It ended on January 19th, 2000. This interface connects to your PC and gathers downloaded preparation instructions and oven timing data from the Internet. Some of this data then appears on the front panel. Press Start. 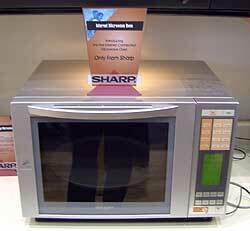 Yes, now microwaves of the 21st century have a "Start" button (just like Windows 95/98). This product allows consumers to get new recipes from the Internet and use their oven to create a wider variety of dishes. 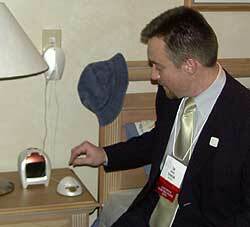 Tim sets the time on the interconnected alarm clock. 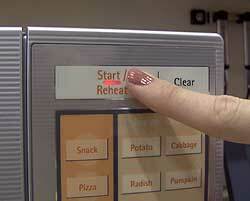 This devices keeps all the other appliances set correctly, thus eliminating the flashing "12:00" syndrome. If for some reason this clock cannot keep time, it can dial out to the Internet and get the correct time. Amazing! See the other clock I saw at the Housewares Show that can keep accurate time without user time setting. 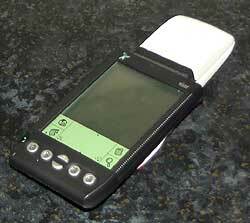 Using the Springboard interconnection capability of this Palm PDA, you can send and receive data from the Thalia master console. Now you can share appointments, family messages and your digital copy of THE GROCERY LIST!! 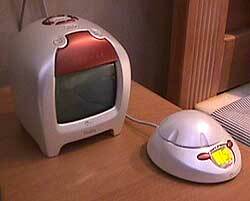 Well, here's proof that we are really in the 21st century! This touch enabled console helps the 21st century family maintain, monitor and control HLT home controls, grocery shopping lists, meal planner, personal schedules, family bulletin board and Internet connection. 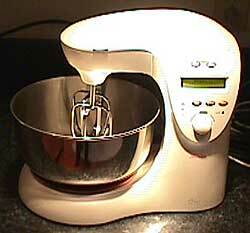 This unique mixer communicates with the master console and assists with recipes. The most unique feature is that since the console tells you each step in the preparation process and the mixer can measure the weight of the ingredient, the ingredient's volume can be calculated. This means no more measuring cups to clean! I like this feature the best!! 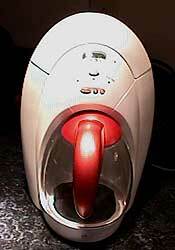 Since this device communicates with the alarm clock, your coffee can be ready when you wake up. It will also remind you if water is not added at night so you don't have to wake up to no coffee because you forgot to add the water the night before. 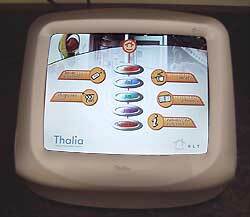 The alarm clock provide time and date information to the other appliances. If HLT enabled smoke detectors are added in the house, any alarm or battery fault will be displayed on this device. Now you will know WHERE the trouble is, instead of having to wander around the house trying to figure out which smoke detector is going off - this is potentially lifesaving technology. 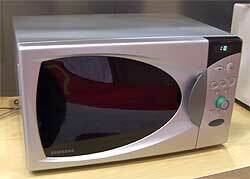 This 1,100 watt microwave (MI5999S) features an Internet connection to cook recipes directly from the Internet. Raymond and Kit pose in front of their high-tech microwave oven that contains a Symbol bar code reader that reads package information from food to be cooked. In the future, new barcode information may be placed on packages to tell smart appliances how to cook them, nutritional information and how to prepare them.